Talgo’s technological developments have always been guided by safety, comfort, economy and simplicity of design. The first Talgo Train was designed in the early 1940s. This innovative train revolutionized rail travel by debuting the same technological principles that today make Talgo Trains the safest, most innovative and reliable passenger trains around. Talgo’s technology has constantly been advanced over the years, enhancing its winning features and developing exciting new ones. From the revolutionary idea of a lightweight, articulated train with an independent wheel system to the present day, Talgo has provided many innovations to the railway industry today, all of them applied to their trains, and some of them, also incorporated on the latest trains by other manufacturers. Its own technology and its innovative nature allow Talgo to reach the highest levels of quality, availability, reliability, safety and respect for the environment in its products, always maintaining a leading position in railway technology development. Talgo’s technological principles and proven features are ideally suited for high speed trains. 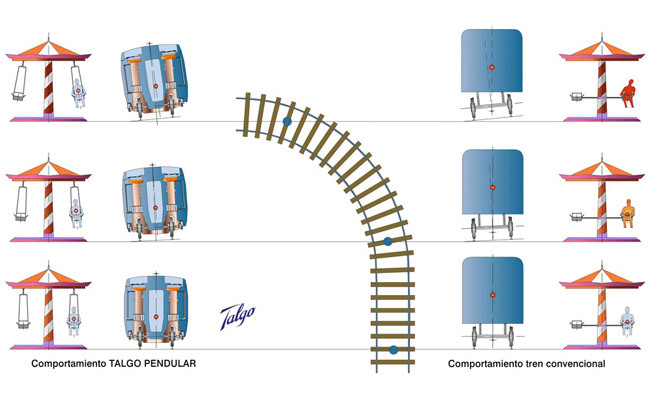 Since 1980, all Talgo rolling stock has been designed with a unique tilting system, developed by Talgo for the Talgo Tilting family of trains. It is a well known fact that all vehicles, when travelling on a curved track, are naturally pushed to the outside of the curve, which makes the carbodies tilt in the same direction. In conventional trains, this effect is solved by reducing the speed on some curves. With the Talgo Natural Tilting system, this movement is reversed and the cars lean naturally “inwards” allowing higher speeds when negotiating curves while maintaining the same level of comfort for the passengers. This system is designed to provide comfort to the passengers when the train is traversing curves at speeds greater than that for which they are super elevated (banked). On tangent track and broad curves passenger comfort is assured by the pneumatic suspension that is an integral part of the tilting system. The natural tilting system makes use of the lateral centrifugal force, which naturally acts on the vehicles when they negotiate a curve to tilt the cars towards the inside of the curve, thus considerably reducing the centrifugal force experienced by the passengers. 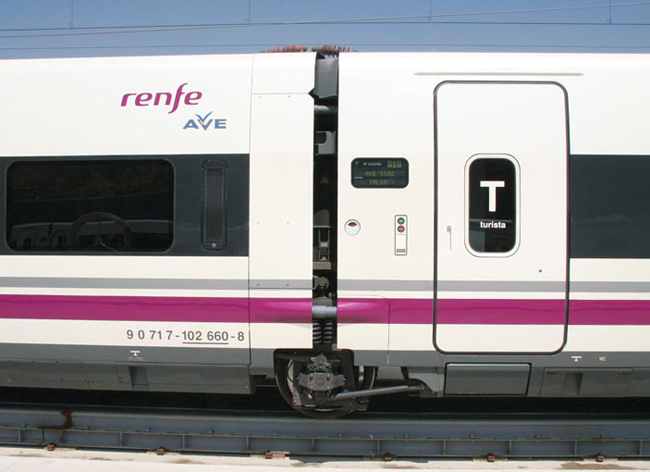 This effect is achieved in Talgo Pendular train sets simply by situating the plane of the main suspension spring assembly well above the center of gravity of the cars. The resulting configuration is similar to that of a pendulum which naturally tilts when centrifugal forces act on it as it passes around a curve. The system is described as passive because it requires no actuator. As it depends exclusively on natural forces, it is completely reliable. This system is very simple in design and does not add cost to the trains. It is also extremely reliable, as it does not rely on complicated electrical or pneumatic systems activated by computers. Talgo was one of the first companies to introduce an articulated trainset concept into the railway sector. From a dynamic and safety point of view, the advantages are clear by bringing more rigidity to the train-set, avoiding isolated overturning and overrunning of the cars. The extreme ends of the end cars have their own trucks, not shared with an adjacent car. Thus the number of trucks in a train is equal to the number of cars plus one. 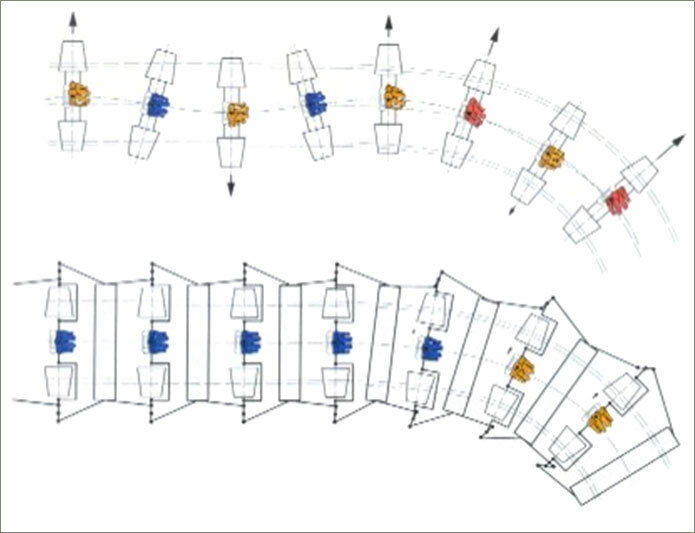 This truck arrangement results in fewer wheels than an equivalent conventional train set and produces active steering, forcing them into a radial position in curves and maintaining alignment in tangents. Each carbody is equipped with a truck which supports one of its ends through two large-section pneumatic suspension springs. The opposite end is suspended by the adjacent car by means of a pair of articulated links (weight bearers) arranged to act as a single point support. 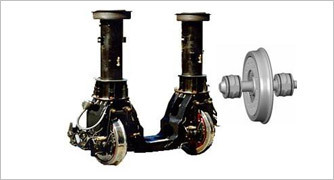 The carbody is thus supported at, effectively, three points providing superior wheel load equalization. 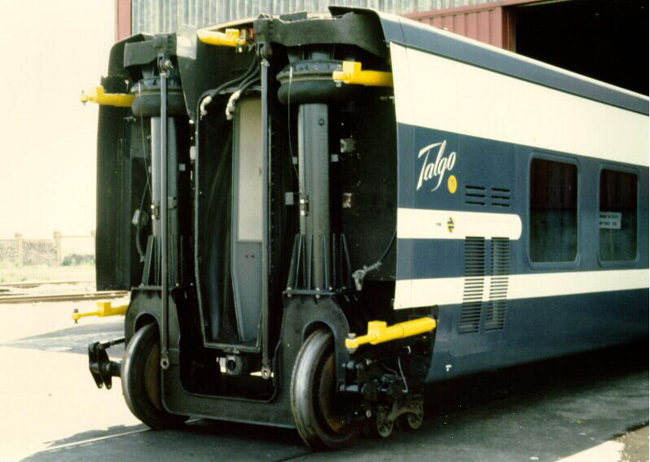 Talgo cars are approximately 43 feet long and are somewhat narrower than conventional cars. The lightweight design and construction offers key advantages to acceleration, braking and the amount of stress placed on the track. Did we mention that we’re short? Short lengthwise design provides egress opportunities that exceed FRA requirements because there are roughly two Talgo cars for one conventional car. The low platform height keeps the center of gravity low and allows Talgo to be the most ADA-friendly passenger cars around. The carbodies are constructed of large aluminum alloy extrusions, welded together using state-of-the-art manufacturing techniques to form a self-supporting structure. Nowadays, the low weight per seat ratio means major reductions in railway operating energy consumption. This energy reduction obviously favors economic operating results and from an ecological point of view, diminishes consumption of energy resources. Given the same power, the acceleration and deceleration are higher. 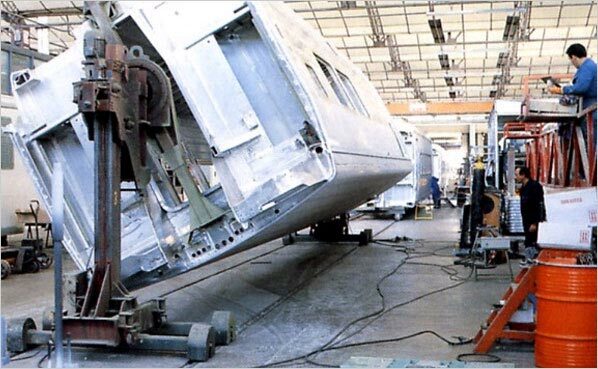 Talgo passenger carbodies are made from aluminum alloys extrusions welded into a strong structure. Nowadays, the weight per seat ratio in Talgo trains is possibly the lowest of all trains in their class, which means major reductions in railway operating energy consumption. This energy reduction obviously favors economic operating results and from an ecological point of view, diminishes consumption of energy resources. The trucks, mounted between adjacent car bodies, will be a two wheel type with wheels free to rotate independently of each other. Trucks with independently rotating wheels offer significant advantages over conventional wheel sets. This arrangement prevents hunting of the truck by providing excellent stability over a wider speed range than is possible with the conventional method. Furthermore, the need for matching the diameter of the two adjacent wheels is greatly reduced, resulting in a significant economic advantage. Independently rotating wheels offer an economic advantage and provide a more stable ride over a wider range of speeds. The articulated connection between cars, with the trucks situated between the carbodies, along with the use of independent wheels, makes it possible for the carbodies to be at a lower height above top of rail than are conventional cars, producing a lower center of gravity. 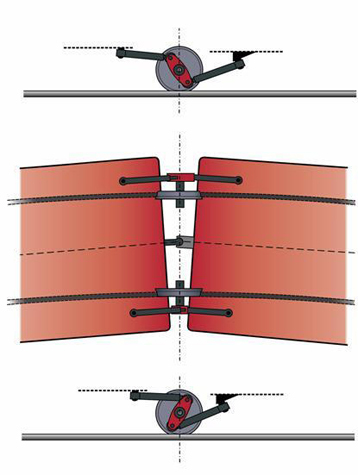 This feature improves operating safety by reducing weight transfer when operating above balance speed in curves. A robust mechanism, formed by an articulated union, maintains the wheels, both on straight track as well as on curves, constantly parallel to the rails. This feature increases operating levels while also reducing the wear and tear on wheels and rails. Talgo’s guided axles allows for increased safety as wheels are kept parallel to the track at all times. The steering system works naturally by connecting each wheel axle to the adjacent cars via two solid guiding devices formed by steel articulated bars. There are no engines or electronic devices involved in the operation. 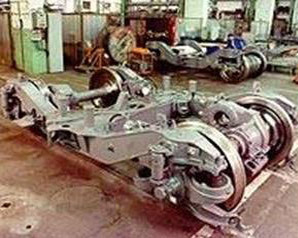 Talgo’s axles and wheels are guided through curves rather than made to fight the rails around curves. The result is remarkable derailment safety, faster schedules because of safer high speeds on curves. Guided axles make Talgo’s light weight possible – conventional riding over conventional trucked wheels must be relatively heavy so trucked wheels will not jump the track when fighting the rails around curves. 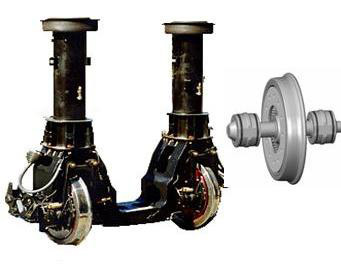 Talgo’s axles and wheels are steered through curves eliminating need for excess weight to keep cars on the track. Talgo trains have a power car. This car is equipped with generators, compressors and water tanks to provide electricity, compressed air and potable water to the train. Therefore, any locomotive (electric or diesel, with or without HEP) can provide motive power. Even when there is no locomotive on the train (such as during a locomotive change), passengers continue to enjoy all amenities and services of the train. The cab and power car will make the train capable of operating in either direction without the need for a locomotive on both ends or for a heavy “NPCU” (de-powered locomotive) at the end opposite the locomotive. 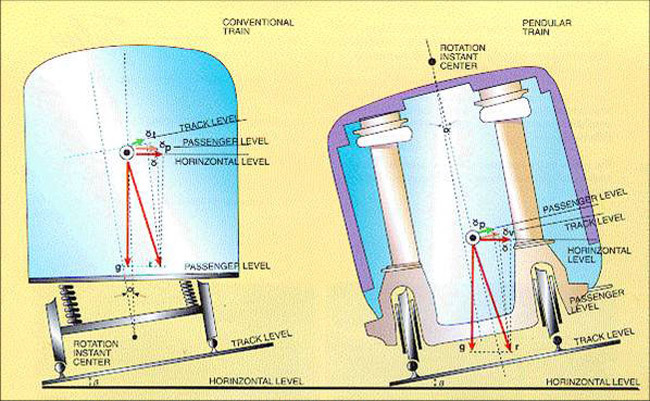 By providing the operator full control of the train while it is being pushed by the locomotive, it eliminates the need to turn the train when its direction is reversed. The body shells of the cars that Talgo is offering are virtually identical to those designed for 220 mph service in Europe. Talgo is presently upgrading existing equipment for higher speeds - these cars will be excellent candidates for upgrading in the future.